The Last Wanderer. An unnamed young college professor goes on a summer adventure in northern Canada alone when the highly interdependent world comes apart and he is unable to return to find his sister and uncle after two years of fires and nuclear meltdown leading to nuclear winter and the death of almost all the inhabitants of the earth that he has known. The unnamed wanderer returns to the Indianhead country of Wisconsin and finds no trace of those who he has lost. While finding wildlife are making a comeback, he finds no one alive and begins salvaging supplies and vehicles to begin his search for a safe place to live and find other survivors of fire, starvation, radiation, and disease. 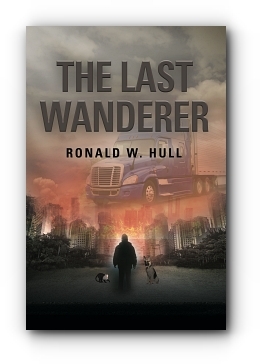 Instead, he finds a new Peterbilt 579 tractor with a sleeper that provides not only a safe place to sleep at night, but a means of traveling the interstate highways in search of others, like him, who may have survived somehow, what had killed all of the others. The wanderer's lonely trip across country finds an unlikely old hermit, Charlie Weaver, and they bond in their effort to improve their lots and search for others, but Charlie is dying of lung cancer and there's nothing that the wanderer can do to save his life from ebbing to a close. The wanderer must go on alone. The wanderer's search for warm winter quarters takes him to Hot Springs, Arkansas, where he happens on another survivor, a teenage girl named Lisa Adams who survived because her father took such care to save her that it cost him his own life. Lisa, immediately falls in love with the wanderer in her own, naïve way. It isn't long before they are expecting a child and have found another survivor, Oscar Bradley. But Oscar, like Charlie, is dying from radiation exposure cancer and meets the same fate. Lisa's fetus is also affected, resulting in a stillbirth. And the stillbirth of their daughter leads to Lisa's death from that ill-fated accident and hemorrhaging. Depressed and utterly alone, the wanderer is consoled by a capuchin monkey that the wanderer names Charlie after his friend and they travel the country looking for more survivors. Along the way, he saves a small German Shepherd mix puppy and names him, Rocky. Rocky and Charlie become helpful and loyal companions in the wanderer's travels. Twice, survivors are found, but they are hostile and the wanderer is unable to make contact. And then, like a miracle, the wanderer finds a commune with 47 people that have survived well, only to have them lost by a predictable, but tragic, natural disaster. Left alone without hope and with the southern United States becoming more tropical and uninhabitable, the wanderer retreats to northern Ontario where he stayed the first two winters and where he finally lives out his life to a surprising conclusion. 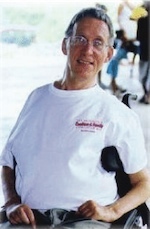 Ronald W. Hull is the author of seven novels, three short story books, and many poems. Dr. Hull has been paralyzed for over 50 years, is now a quadriplegic and writes primarily by dictation. Ron resides in Houston, Texas.